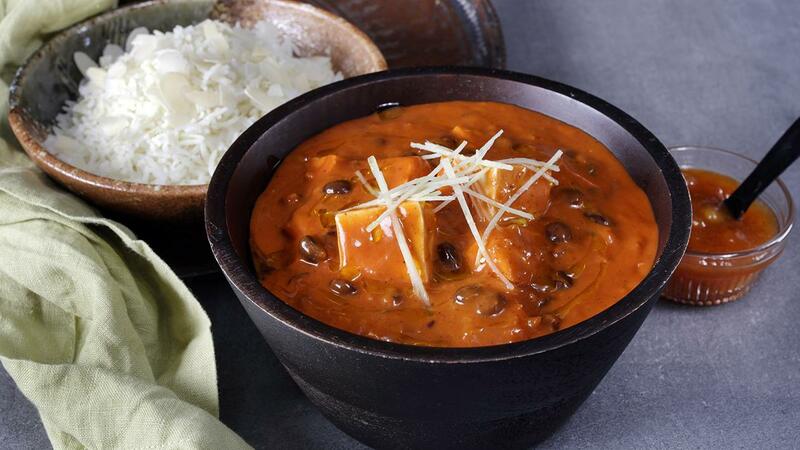 Tofu is a great substitute for Paneer, an ingredient we should cook with more often, light and healthy, perfect for Ramadan. Knorr Tomato Puree makes this recipe quick and easy, it’s already cooked for you. Try Knorr Tomato Puree this Ramadan. Roughly cut into 1" cubes. In a skillet, over medium heat, add the Rafhan Corn Oil and the tofu. Allow the tofu to cook for about 1 minute per side. Just slightly brown the tofu - do not overcook as the tofu will take on a tough, chewy texture. Cook the rice in water seasoned with Knorr Chicken Stock Powder, once cooked mix in almonds and keep until curry is cooked. In a separate sauce pan, over medium heat, add the butter and let it melt. Add the onions, garlic and ginger. Cook for 2-3 minutes. Add the tomato paste, chilli powder, garam masala, curry powder and brown sugar. Stir to combine. Dissolve Knorr Chicken Stock Powder in warm water and add to the pan. Bring mixture to a slight boil. Add black beans and Knorr Tomato Puree, simmer for 5-10 minutes. Once flavours have developed add yoghurt, stir a few times and remove from the heat. Garnish with julienne ginger and serve a bowl of mango pickle or chutney on the side.